The red curve is a cubic Bezier. The blue one is supposed to be the 4th order Bezier, which is the same as cubic Bezier, but in this case, they are not the same ?! 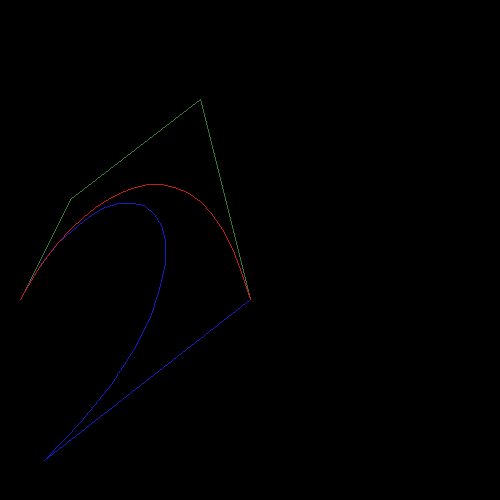 ...runs from 0 to n, ie for an n-th order bezier you need n+1 points. You have 4 points, so you're drawing a 3rd-order bezier. otherwise you're only iterating from 0 to n-1. You are trying to construct a 4th-order Bezier curve on only four points. No wonder it's not working. Not the answer you're looking for? Browse other questions tagged c geometry computational-geometry bezier curve or ask your own question. How to determine if a list of polygon points are in clockwise order? Closest point on a cubic Bezier curve? How to remove a node of a Bezier curve so that the shape of the curve does not change? How to get correct shape outline of closed bezier path?